2013 6 Bred & Owned First Place Wins! 2015 OFFF Best of Show Female both Judges! Rosabella is bred to Marisco for a September 2019 baby! Rosabella is everything you would hope for when crossing some of your very best animals. As we suspected would be the case when we created this pairing, she got both of her parents positive traits! Rosabella has no linebreeding in her pedigree. She is Peruvian, English, Canadian and North American. Rosabella's overall balance, substance, conformation and style is amazing. On top of that she has been a therapy llama and was Complex Registered with Pet Partners (she is on maternity leave right now). WE LOVE THIS GIRL! 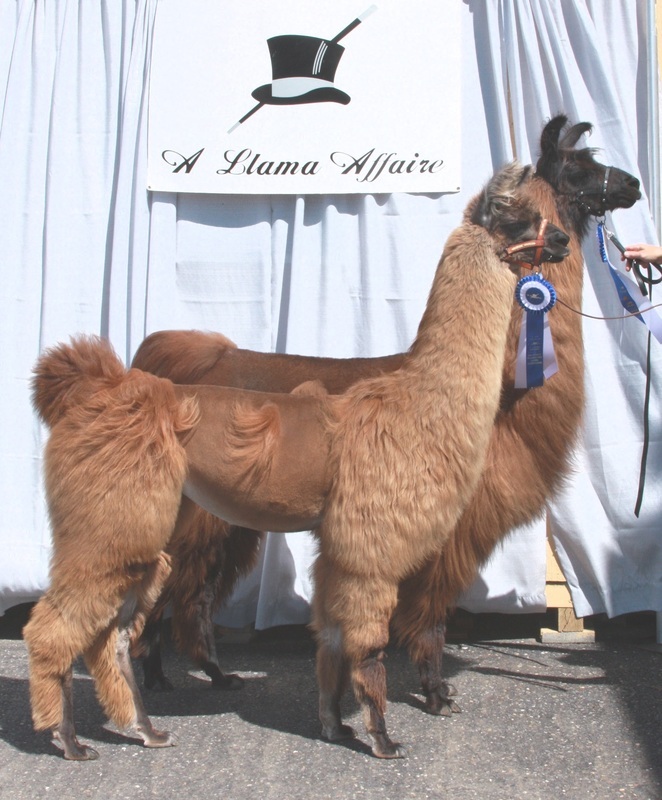 Rosabella's full sister Frisella won Best of Show Llama for the California State Fair in 2011 and again in 2014. We had intended to keep her, but sold her to David Armer after he lost his best female. Rosabella's other half sister Venicia from 2009 has been winning in halter and performance for the McWhorters. Her older brother Sirmione was in our showstring as a gelding and has won all his halter titles in the ILR-SD. Oldest brother Macchiato was a big halter and performance winner for the Howks of TN. JNK Normandie's Gevalia a half sister is owned by the Spekreijse's of New Zealand and has all six of her ILR-SD Halter titles. 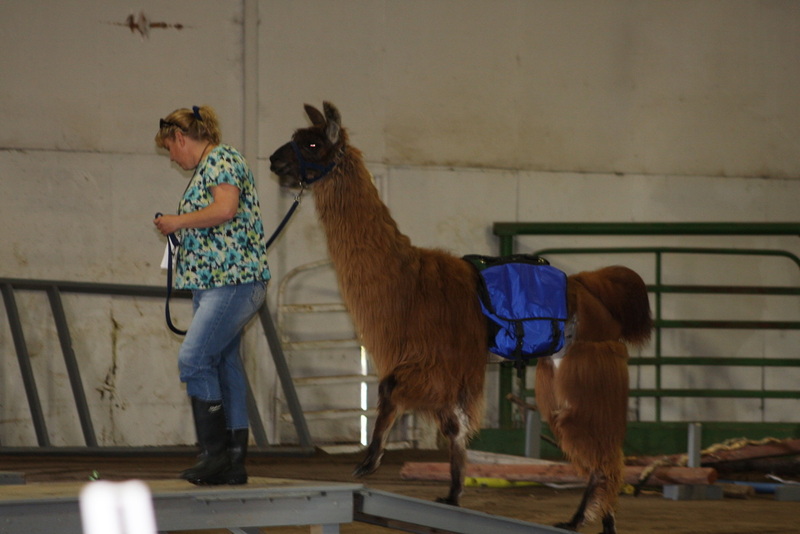 Gevalia was also a Complex Registered Therapy Llama! Normandie's final offspring JNK Marisco's Ducati is just starting his halter & performance career with Roy and Holly Williams. Needless to say, this line is our most consistent dam line. I had to finally tell all of Normandie's fans that WE ARE KEEPING THIS ONE, DON'T EVEN ASK! The Huaycool ingredient cannot be underestimated here. Huaycool in a very limited production history, has produced several offspring that are cleaning house in the halter and performance showring. He also throws a sweet and easy disposition that is perfect for therapy and performance work. Rosabella has finished all of her ALSA Halter and ILR Halter & Performance titles. She finished her 2015 show season 4 months pregnant and Double Grand Champion Light/Medium Wool Female & Double Best of Show Female. Rosabella finished her ALSA Halter Champion in two shows, putting it mildly, she is awesome! Rosabella had a male baby JNK Marisco's Rustamone April 19, 2016 that was already spoken for several times over! There are over 45 Grand Champions & 16 Reserve Grand Champions in Halter and 15 Halter best of shows in this pairing (just mom and dad). 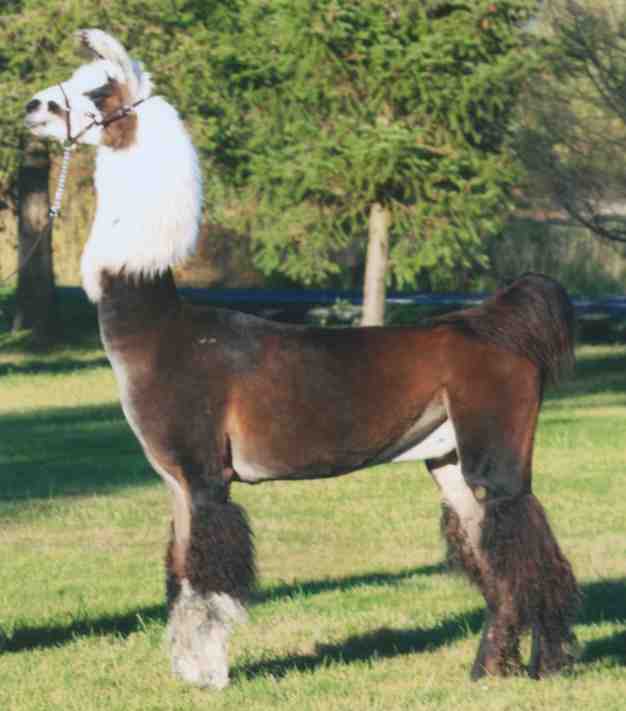 Not to mention numerous performance and versatility titles between these two llamas. 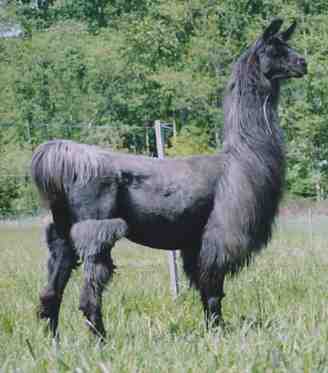 Best of all, both mom and dad have been complex registered therapy llamas! ​At his very first show in the fall of 2016, Rustamone won Double Grand Champion Silky Wool Male in a large competitive division. His mother was Double Grand Medium Wool Female, Best of Show & Overall ILR-SD Western Regional Champion Female. ALSA Halter Champion in only two shows! JNK Huaycool's Rosabella, May 2016 after her first baby! *Six Months Pregnant at the time of showing. *Pregnant at the time of showing.